 Transportation in California is funded from a variety of state, local, and federal fund sources.  State funds consist primarily of the state excise tax on gasoline and diesel fuels and truck weight fees.  Additional fund sources include most of the state sales tax on diesel fuel, a small portion of the state sales tax on gasoline, bond proceeds, and appropriations of General Fund revenue. 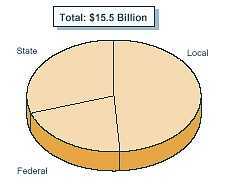  In 1999-00, state funds are estimated to provide about $4.5 billion for transportation purposes.  Federal transportation funds are apportioned to California based on the state's contribution to the federal Highway Trust Fund through federal taxes on gasoline and diesel fuel.  In 1999-00, California is estimated to receive about $3.3 billion in federal transportation funds.  Over one-third of local funds for transportation are derived from optional local sales taxes (on all sales, not just gasoline) dedicated for transportation purposes.  In 1999-00, we estimate that local funds will constitute half, or about $7.5 billion of all revenues for transportation.  State and federal transportation revenues are collected primarily through the state and federal excise (per gallon) taxes on gasoline and diesel fuel. 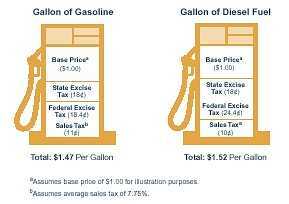  18 cents in state tax for each gallon of gasoline and diesel fuel (generally referred to as the "gas" tax).  18.4 cents in federal tax for each gallon of gasoline.  24.4 cents in federal tax for each gallon of diesel fuel.  7.25 percent uniform state and local sales tax, plus optional local sales taxes for transportation or other purposes varying by county. 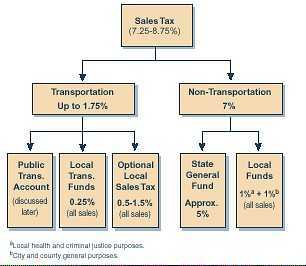 The majority of the uniform state and local sales tax proceeds are not used for transportation purposes.  The state also collects weight fees on commercial vehicles (trucks) based on the unladen weight of the vehicle.  The state receives about 65 percent of the revenues from the state gasoline and diesel excise taxes, while cities and counties receive about 35 percent for local streets and roads. 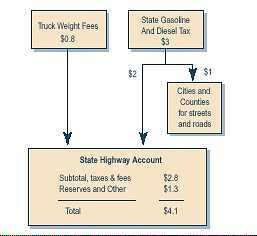  The state's share of the gasoline and diesel tax revenues, along with truck weight fees, are deposited in the State Highway Account (SHA).  The California State Constitution (Article XIX) restricts the use of state gasoline tax revenues for certain purposes. These monies may only be used to plan, construct, maintain, and operate public streets and highways; and to plan, construct, and maintain mass transit tracks and related fixed facilities (such as stations). The gasoline tax revenues cannot be used to operate or maintain mass transit systems or to purchase or maintain rolling stock (trains, buses, or ferries).  In addition to state and federal excise taxes paid on each gallon of gasoline and diesel fuel, California imposes sales tax on most purchases, including gasoline and diesel fuel.  Statewide, there is a uniform sales tax of 7.25 percent on most purchases. This sales tax rate can go up to 8.75 percent when optional sales taxes are included. The sales tax rates paid in California are a combination of several tax rates levied by the state and individual local governments.  State Tax Rate. This is a 6 percent uniform rate which includes a 5 percent General Fund rate, plus two one-half cent (totaling 1 percent) special fund rates for local health care and criminal justice purposes.  Uniform Local Tax Rate. A 1.25 percent uniform rate is levied in all counties. Of this total, 1 percent is allocated to cities and counties for general purposes, while the remaining 0.25 percent is dedicated to transportation.  Public Transportation Account. A small portion of the sales tax on gasoline and the majority of the sales tax on diesel fuel is provided to this account (as discussed in greater detail later). This account supports mass transportation activities.  Local Transportation Funds. A 0.25 percent uniform tax on all sales is dedicated to transportation uses, primarily for transit.  Optional Local Sales Tax. Optional sales taxes (0.5 percent to 1.5 percent) may be imposed by local governments for transportation purposes. These activities include highway construction, street and road maintenance, and subsidies for transit operations.  State General Fund. Essentially 5 percent of the uniform sales tax is dedicated to the state General Fund.  Local Funds. A 2 percent uniform sales tax provides revenues for local purposes. One percent is dedicated to local health and criminal justice purposes. The remaining 1 percent is for city and county general purposes.  Nontransportation Purposes. 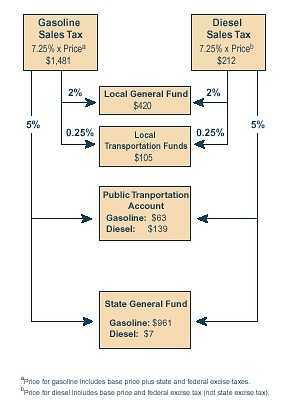 As the figure shows, the bulk of sales tax revenues from the sale of gasoline and diesel goes to nontransportation purposes. Of the total sales tax revenues ($1.7 billion) from these products in 2000-01, about 82 percent ($1.4 billion) will go to local and state general fund purposes. This includes $420 million for local general fund purposes and almost 1 billion for state general fund purposes.  For each gallon of gasoline, the state sales tax of 4.75 percent on 9 cents of the state excise taxequivalent to 0.4275 cents per gallon of gasoline (about $63 million in 2000-01)goes to the Public Transportation Account (PTA). The PTA is the primary source of state funds for mass transportation purposes, and the only state transportation fund which can currently be used to purchase rolling stock (that is, buses, trains, or ferries).  State sales tax of 4.75 percent on the price of each gallon of diesel fuel (including the federal excise tax, but not the state excise tax) goes to the PTA (about $139 million in 2000-01).  State sales tax of 0.25 percent on all sales is deposited in the Local Transportation Fund (LTF) which is generally restricted to local transit needs (about $1.1 billion in 2000-01 including about $105 million from gasoline and diesel fuel sales). Provides a 40 percent increase in funding authorization nationwide. Total authorization of $217 billion includes $175 billion for highways and $42 billion for transit. California expects to receive about $15 billion for highways and $5 billion for transit over six-year period. Guarantees that all new fuel tax revenues will be used for transportation over six years; only $13 billion (of the $217 billion) is subject to annual congressional action. Provides about $25 billion in discretionary grants. Guarantees that certain states, including California, will receive a minimum of 90.5 percent return on its gas tax contributions to the federal Highway Trust Fund. Provides $9.3 billion for specified "high priority" projects nationwide, and about $877 million for specified California projects. Provides incentives to encourage states to lower legal intoxication levels to .08 percent, and to encourage increased seat belt use rates. Makes preventive maintenance eligible for transit funding. Eliminates operational subsidies for urban areas with populations greater than 200,000.  Source of Federal Funds. California's share of the federal fuel taxes (18.4 cents per gallon of gasoline, 24.4 cents per gallon of diesel) is deposited in the federal Highway Trust Fundthe fund source for all federal transportation spending.These revenues are returned to the state via the federal Transportation Equity Act for the 21st Century (TEA-21), which authorized $217 billion to be invested in highways and transit infrastructure nationwide from 1998 through 2004.  Basis for State's Share. The state's share of funding for the major highway and transit programs is based on a variety of factors, including highway lane miles, congestion, population, and air quality. The state and local agencies may also apply for discretionary grants on an annual basis.